This Norlys Karlstad 1 light hanging outdoor porch lantern in galvanised steel with traditional style and rated IP55 features classic design. Circular ceiling mount, chain suspension and hanging lantern, with domed roof, wide brimmed shade and pill glass lantern. Manufactured by Norlys, a Norwegian manufacturer who offer an unrivalled 15 year structural guarantee. 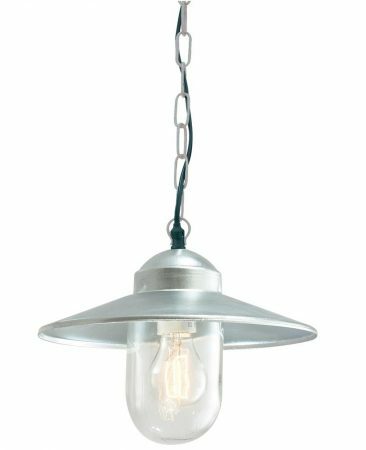 If you are searching for quality outdoor lighting to complement your home, this galvanised porch chain lantern should be considered. It looks fantastic by any front door to welcome visitors after dark. Exterior fittings must have an IP (Ingress Protection) rating which indicates the fittings ability to prevent solids and liquids penetrating the enclosure. The higher the number, the greater the protection. The minimum rating for an outside light exposed to the weather is IP23. 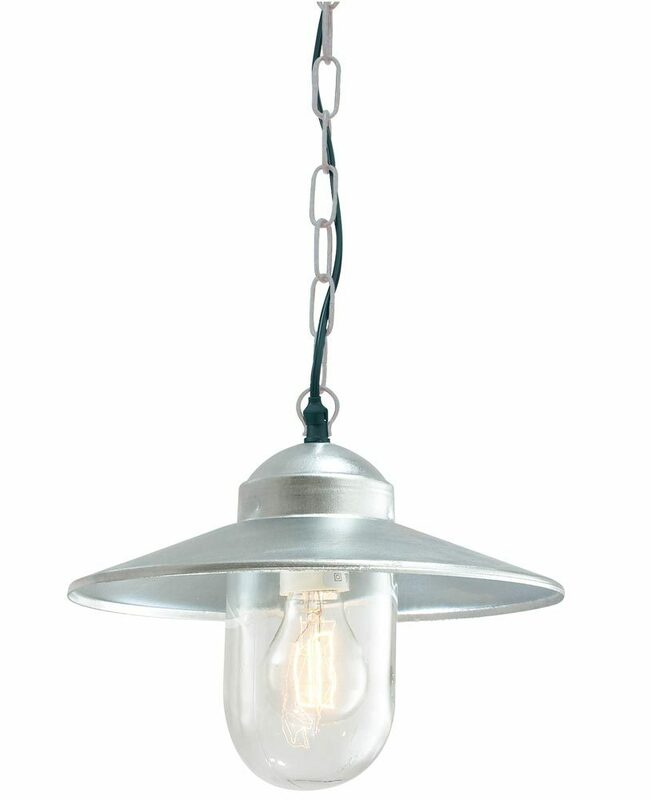 This hanging outdoor porch lantern is rated IP55. This is a Class 2 double-insulated fitting that must not be earthed and can be safely used on older properties without an earth circuit. There is a matching Karlstad outdoor wall lantern available, please see below and also available in a black finish. This exterior light is supplied by Elstead Lighting and manufactured by Norlys, a Scandinavian company with 50 years experience in the design and manufacture of exterior lighting designed to withstand tough climatic conditions, such as the Karlstad 1 light hanging outdoor porch lantern in galvanised steel and rated IP55 you see here.